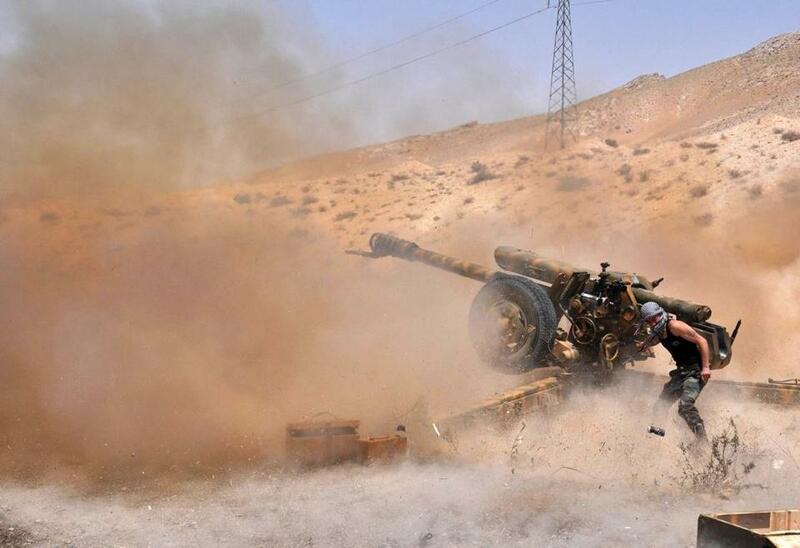 A Syrian army soldier fired artillery shells towards ISIS fighters in northeastern Palmyra on May 17. As the terror gang known as ISIS takes more territory in Iraq and Syria, the United States is being pushed toward a decision we desperately want to avoid. The question is as stark as it is simple: What shall we do if ISIS threatens to take Baghdad or Damascus? Watching it seize large swaths of land and important cities across Mesopotamia has been painful, but allowing it to install itself in the capital of Iraq or Syria would represent defeat on a far larger scale. Holding a capital would allow ISIS to claim ownership of a state, and even demand recognition from other countries. Given its savagery and proclaimed hostility to much of what humanity holds dear, this seems intolerable. Yet as ISIS reaches closer to Baghdad and Damascus, it is hardly an unrealistic threat. If it materializes, Americans will face a distressing choice. Every option is fraught with danger. The most obvious answer would be to send the US Army. This would guarantee short-term success. American troops would certainly be able to hold off any guerrilla assault. But that would hardly constitute victory. In fact, a decision in Washington to send troops to Iraq or Syria would be a great gift to ISIS. Grotesque acts of terror, like mass executions and public beheadings, play a key role in the ISIS strategy. They are aimed, above all, at drawing the United States back into the Middle East. By projecting these horrors into American living rooms, ISIS hopes to drive our anger to such a peak of intensity that we will abandon reason and send troops back into the quicksand where they suffered devastating defeat only a few years ago. One alternative might be to try pressuring the United Nations into approving a mandate that would legalize an American invasion of the Middle East, and then recruit other countries to join our campaign. Much of the world, however, would recognize this as an exceedingly thin fig leaf. The answer begins with a senseless loss of life now accentuated by a crude erasing of the historical record. Aerial bombing campaigns against ISIS can be successful, and the US has used them effectively in Iraq. We have been far more reluctant to bomb ISIS units in Syria. That would mean we were killing militants who want to overthrow President Bashar al-Assad, who we also consider an enemy. We want to prevent ISIS from taking Damascus but are reluctant to defend Damascus, because that implies defending Assad. Of all the bizarre contradictions that define our policy toward ISIS, this is the most surreal. We refuse to face the possibility that in the end — which may come soon — we may have to choose between Assad and ISIS. This should be an easy choice, but our refusal to fight ISIS in Syria reflects the power of our shortsighted decision to break irrevocably with Assad. His war on his own people has been shockingly brutal, but if ISIS takes control of Syria, the genocide that could follow will make us wish we had him back. Sending American ground troops back to the Middle East would only deepen the disaster that enveloped us the last time we tried. Bringing other countries along with us in a bogus “coalition” is hardly a better option. Bombing can achieve temporary results, but the only way to turn the tide of battle is with motivated ground troops. Many of the local allies on whom we hoped to rely, like tribal militias and Iraqi army units, have either collapsed or joined ISIS. It is a bleak panorama. Two powerful forces in the region are highly motivated to fight ISIS and willing to intensify their engagement — if the US would agree. The first is the Kurdish army loyal to the regime in northern Iraq. We should take advantage of this unused asset. It would not, however, be enough to turn the tide of war. A larger and more organized force would have to complement the Kurds. One power in the region has such a force: Iran. Most Iranians are Shia Muslims, and ISIS wants to kill every Shia. No country is more ready and willing to fight these fanatics than Iran. Iranian forces, euphemistically called “Shia militia,” and Kurdish forces are already fighting ISIS, but the US is reluctant to ask them to step up their commitment. By arming the Kurds we will anger the government in Baghdad, which fears their power. By encouraging Iran, we will outrage another of our so-called allies, Saudi Arabia, which is an important source of support for ISIS and related groups. Besides, we have demonized Iran for decades, and that emotion prevents us from considering it a potential partner in anything. If Kurdish and Iranian forces can bring the battle to ISIS in ways that do not further inflame sectarian tensions, it is in our interest to encourage them. First, though, we must decide whether crushing ISIS is really our priority. We have not yet done so. Jeff Jacoby: Why does ISIS behead its victims?